I have a dear friend who was recently in the hospital for a heart repair. As far as I am concerned, there is not one single thing wrong with his heart, but some rather renowned cardiac surgeon felt otherwise! Anyway..... he and his dear wife are doing well. She is certainly relieved and happy to have him home and heading for a full recovery - GREAT news!! His heart is mending beautifully! 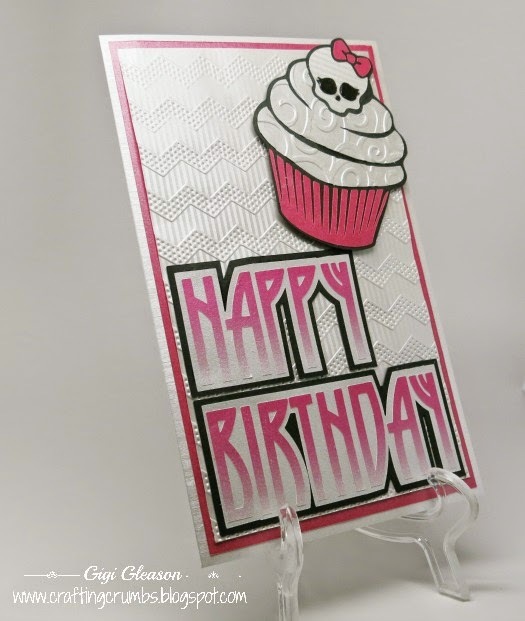 My inspiration for the card was one of the Dreamweavers stencils. They have a wide variety of beautiful stencils (many of which are quite at home in my craft room! )and some of them are vertical greetings. 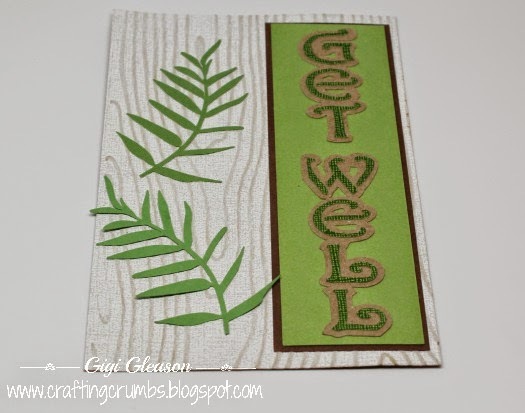 I used a take off on their Get Well greeting, cut it out of some fun Coredinations card stock that I have had sitting around here forever, and then cut a lot of layers with the Silver Bullet Professional. The greeting is backed with Paper Temptress brown bag, the rectangle is Coredinations and the mat shadow is Paper Temptress Basis card stock. 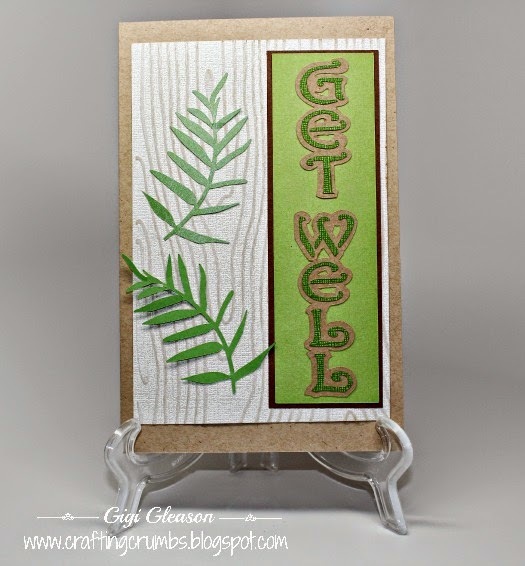 I used some white and taupe Coredinations for the background that I ran through a Teresa Collins embossing folder (Woodgrain) and then distressed it to show the detail of the embossing. I love the look of that and have vowed to do more of that - it was like watching magic before my eyes. :) I think the light sanding really made the woodgrain pattern pop!! The whole thing was placed on Kraft card stock from.. you guessed it.... Paper Temptress. Wanted to share a close-up of the woodgrain distressed. I love the wood pattern. 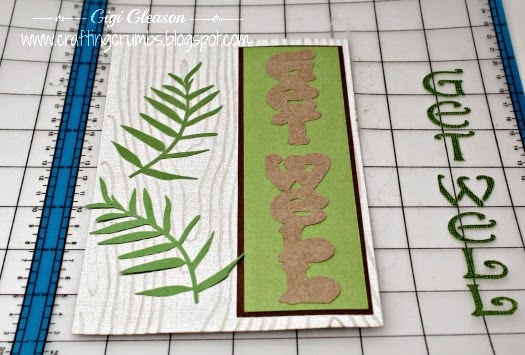 Since this card was for a male, I didn't want to overdue it with too much, so I used the Fern Branch from Penny Duncan Creations (thank you Penny!) 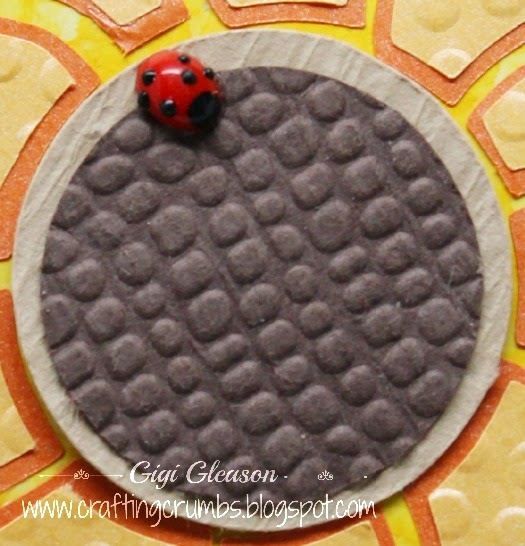 and cut it out of Paper Temptress Mica and Pop Tones papers to add a slightly different look. 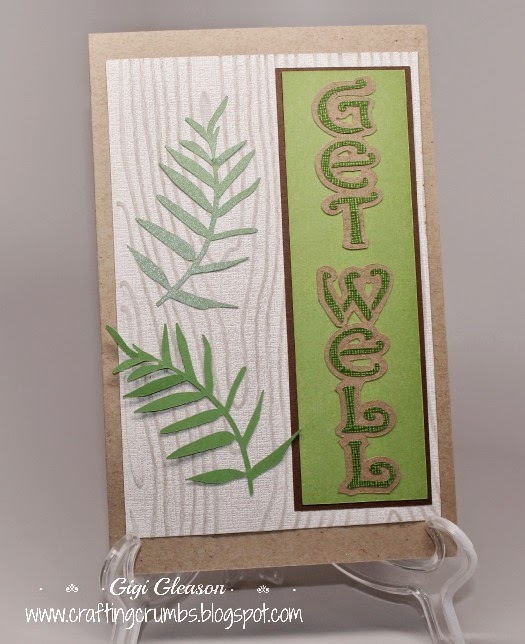 This was a relatively simple card for me and I would like to play around more often with the vertical greeting idea -it was a fun twist. 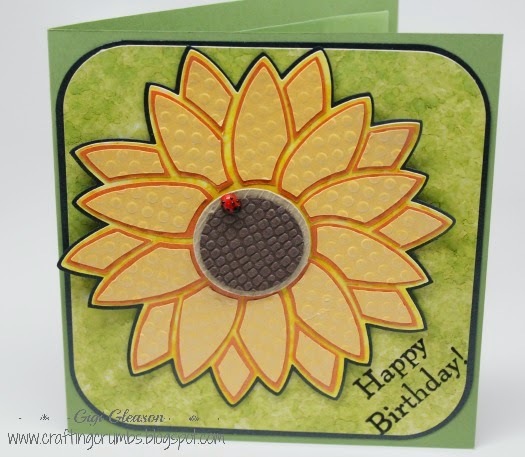 You may think it strange that I chose to do a sunflower for a spring birthday, but that is her favorite flower . And honestly, I wouldn't mind channeling a little fall weather right now with all of the heat and fires we have had here in San Diego county the past week. It has truly been the worst I have ever seen, and I have lived here most of my life. I have never seen the Santa Ana winds that bring the hot, dry air in the month of May - never. And ten fires in two days all in our county? It has been absolutely unbelievable. I am so very grateful that no one I know lost their home or was injured. And I am counting my blessings. There are dry areas of brush and growth everywhere and , as my parents always said, "there but for the grace of God go I." So today, I am full of gratitude. I felt I could happily send to my daughter! So...... late last night I decided I just needed to try again and do something different . 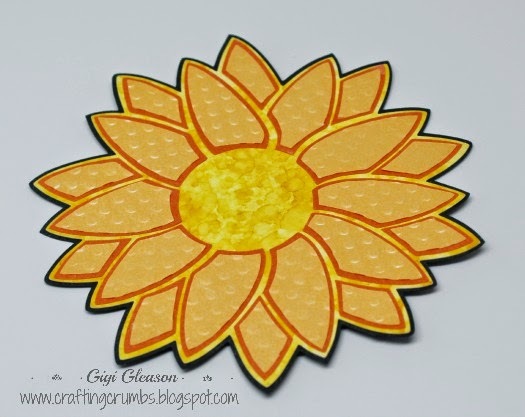 Feeling like I needed to stick with the sunflower theme, I found a free clip art of a sunflower stencil that seemed quite simple. Of course, true to form , I could not leave well enough alone! LOL So I traced the design in SCAL and added several shadow layers for a little more interest. 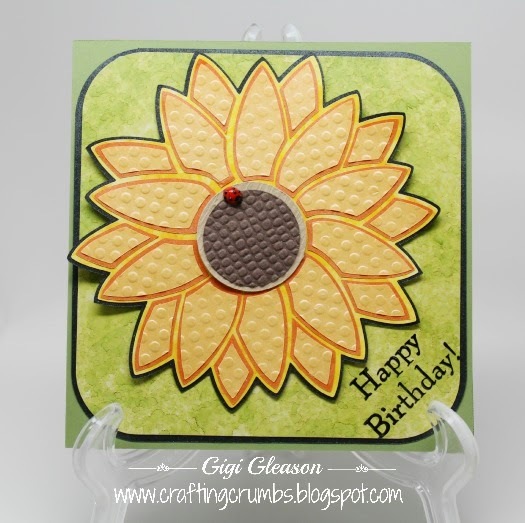 The shimmery papers that I love are from Paper Temptress - the mica line - and the center of the sunflower is ruche paper - love the texture and it cuts easily with the Silver Bullet Pro. 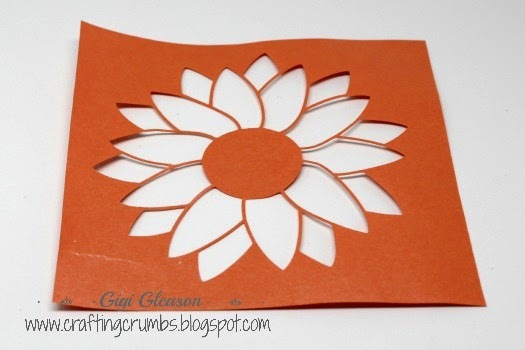 Individually embossed the petals (5 at a time so I wouldn't lose the placement) and glued to the orange(truer color below) before I removed them from the mat. 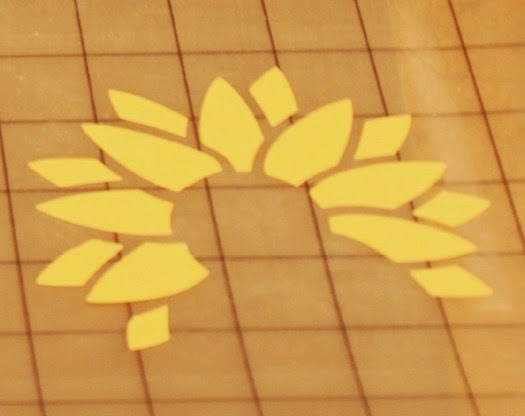 An unexpected bonus - a negative stencil created from the orange petals. Expect to see this as part of another card at some point! antracite mica (Paper Temptress) to give it that "pop". 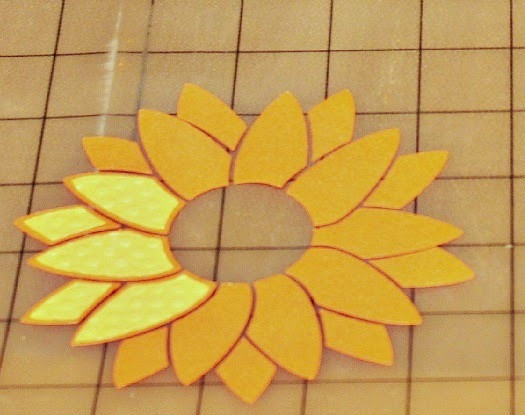 I embossed each of the amber sunflower petals with a dot embossing folder before attaching them to the flame petals. And the dark brown ruche center was embossed with a "mesh" folder for even more texture. 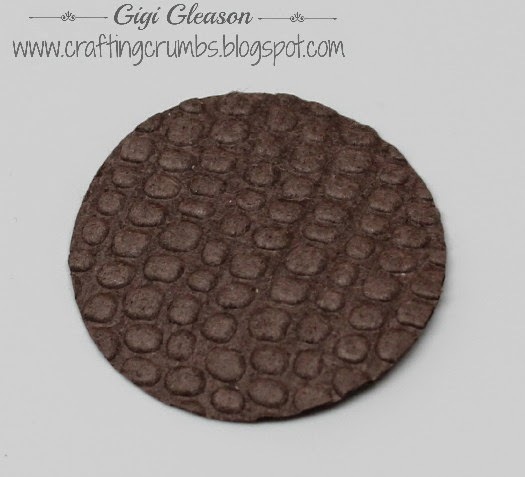 Chocolate brown ruche cardstock (Paper Temptress) embossed with a the Mesh embossing folder. The sunflower center with a visitor. Do you love that little ladybug as much as I do?? 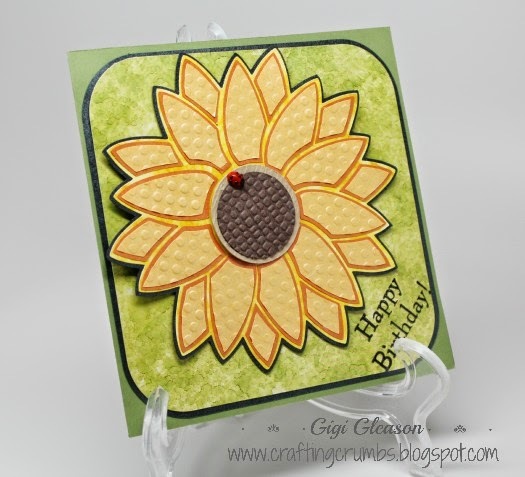 A view of the finished card with all of the elements together. So happy with this one! Another view. It's all about the ladybug - she makes me smile! This is one of those times when starting over was clearly the right thing to do. I hope you enjoy these cards - and learn from my mistakes. I would like to say that I will not make this same error again, but...... I don't necessarily learn the first or even second time around. I am still going to think about how to save part of this so if I come up with a good alternative (already thinking of one) I will post it later... so stay tuned for more experiments from the craft room. And I have a ton of online class videos to watch, so hope to be having some fun with new techniques. I want to improve my marker coloring, play with colored pencil shading that I used to love to do, learn how to stamp with watercolors and more. Also looking forward to having a little more time in the kitchen to share some fun summer recipes. Family Birthday Cards.... Part Two - My Youngest Granddaughter! I can hardly believe that my youngest granddaughter will be 8 in a few days. How could that be?? I love this age - she is still a little girl, but there are glimpses (thank goodness they are quick) of the young woman she is becoming. Please let the time slow down!! 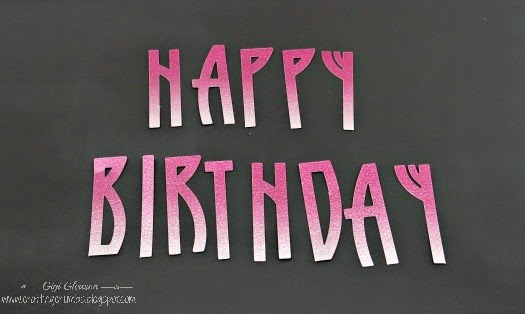 A special note about her May 5th, Cinco de Mayo, birthday. She was born on my dear father's birthday, her "Papa", as my children fondly and adoringly called him. Unfortunately, they never had the pleasure of meeting each other, but I have no doubt there is a special place in their hearts for each other. So....what kind of card do I make for an eight year old?? After talking to her Mom, my card choices were anything related to Frozen (what a great movie!! ), Monster High (I was clueless! ), One Direction or Wonder Woman!! 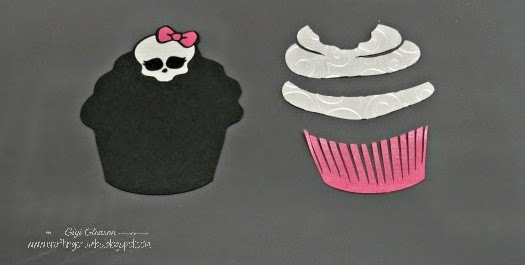 After doing some searching for inspiration , I settled on the Monster High logo. I am not a big fan of skeleton skulls, but the little girl was just too cute!! So I found the same font on Dafont.com and tried to imitate the color patterns. It is called Runy Tunes Revisited! What a name! 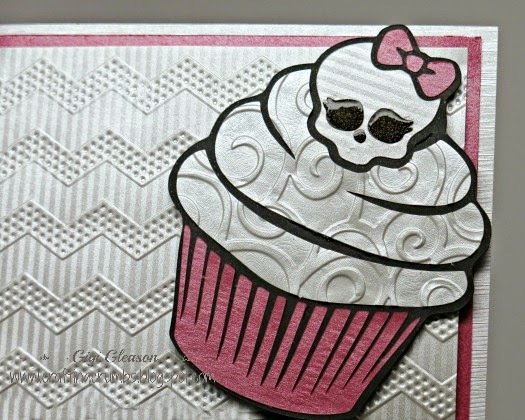 I traced the logo in SCAL and made the cupcake with a variety of papers from Paper Temptress. The gradient paper is actually a pattern made in Inkscape and printed on to Luster canvas text weight paper from Paper Temptress too. I love the way the letters still shimmer through the ink. 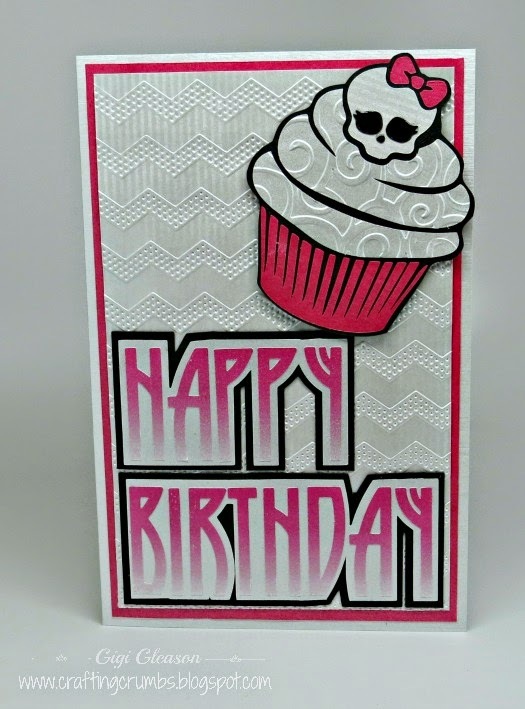 This card was so much fun and I hope she has as much fun receiving it as I had making it! 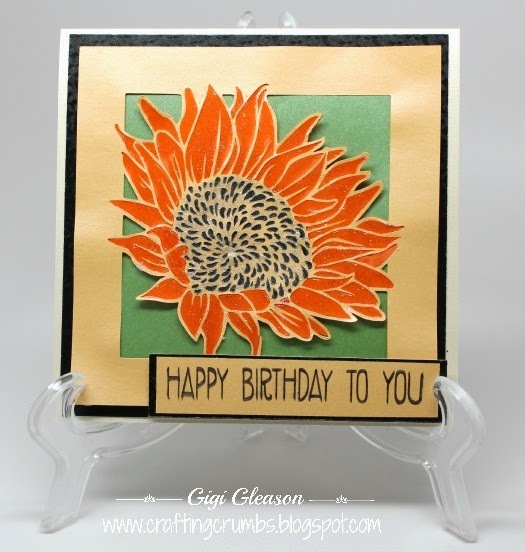 All of the papers used are from Paper Temptress - the mica, luster and sparkle lines. 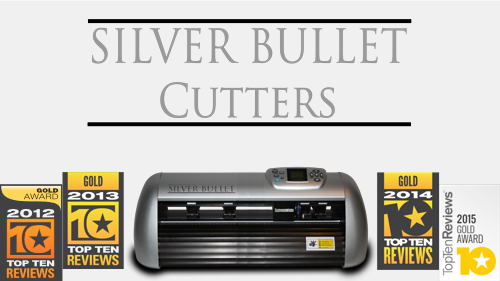 There are more details below under the pictures. 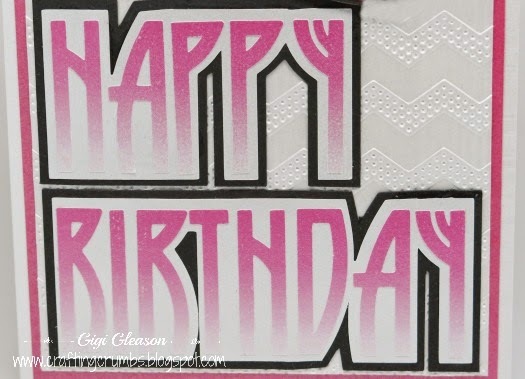 A closer look at the Azalea Mica in the bow and wrapper and mat with the embossed Luster frosting (D'Vine Swirl - Cuttlebug) and embossing on the Laser Luster )Dotted Chevron - Teresa Collins) for the background. I love the layers of texture. Glossy Accents make the skull eyes shine! The cupcake is on pop dots to give it a little more dimension. very sweet eight year old girl.